The 35th Infantry Regiment Association salutes our fallen brother, SGT Bernard Gordon Walinski, who died in the service of his country on July 3rd, 1966 in Pleiku Province, Vietnam. The cause of death was listed as Small Arms/AW. At the time of his death Bernard was 25 years of age. He was from Baltimore, Maryland. Bernard is honored on the Vietnam Veterans Memorial at Panel 08E, Line 126. The decorations earned by SGT Bernard Gordon Walinski include: the Combat Infantryman Badge, the Bronze Star with V, the Purple Heart, the National Defense Service Medal, the Vietnam Service Medal, the Vietnam Campaign Medal and the Vietnam Cross of Gallantry with Palm Unit Citation. Bernard was known to family as "Ben". Sgt. 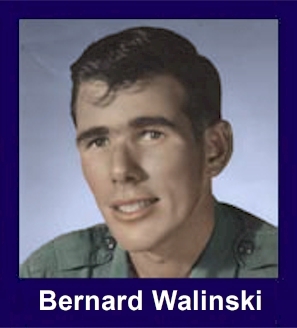 Bernard Walinski, 25, of 135 1/2 Sibley Street, died in Vietnam on July 3 of wounds suffered while serving with the 3rd Brigade of the 25th Infantry Division. He is survived by his mother, Mrs. Helen Walinski of Hammond; his father Arthur with the Army; and one sister, Mrs. Margaret Kreczmer of Chicago. Services will be Wednesday at 9 a.m. in Burns Funeral Home, 5840 Homan Ave, and at 9:30 a.m. in St. Joseph's Church. Burial will be in St. Joseph Cemetery. For heroism in connection with military operations against a hostile force. Sergeant Walinski distinguished himself by heroic actions on 3 July 1966, in the Republic of Vietnam. On this date Sergeant Walinski was serving as a squad leader in the 1st Platoon, Company B. 1st Battalion 35th Infantry. While moving to reinforce another platoon already engaged with the enemy, Sergeant Walinski's platoon drew intense automatic weapons fire from a company of North Vietnamese soldiers on their front and right flank. Sergeant Walinski was sent to the right flank with his fire team to reinforce the friendly troops there. Seeing that the enemy had two machineguns firing on the platoon flank and realizing the exposed position of the platoon, Sergeant Walinski fearlessly assaulted the nearest bunker, throwing grenades and firing his weapon. In this act of unimpeachable valor Sergeant Walinski lost his life to the enemy machinegun. His actions were an inspiration to all of those who saw him and his firm resolve to resist the enemy to his utmost bolstered the determination of his comrades to accomplish their mission despite the heavy odds they faced. This outstanding display of aggressivness, devotion to duty, and personal bravery is in keeping with the highest traditions of the military service and reflects great credit upon himself, his unit, and the United States Army.